Over the past two years I’ve become a Frontera groupie. I was lured in by the ingredient label (all natural ingredients, gluten free, no preservatives, no trans fat) and hooked because of the great flavors. My husband and I love their salsas and chips (we eat the medium and hot ones and the kids love their basic mild) and I was extremely impressed with the lunch I had in Chicago at Rick Bayless’ (Frontera originator) Xoco restaurant. Since the weather is starting to turn to fall it’s the perfect time to showcase Frontera’s line of seasoning sauces and mixes. The first time I tried one was back in Minneapolis when I was working full time with kids. I used the Garlicky Carnitas Slow Cooker Sauce and since then I’ve had the skillet sauces, guacamole mixes and other flavors of slow cooker sauces. We use the Frontera packets anytime we make tacos and after tonight I’m further hooked. I tried the Chipotle Chili Seasoning Sauce and was pleasantly surprised with the full bodied flavor my chili had. I didn’t have a recipe but sauteed an onion, green pepper and garlic clove then added red kidney beans, garbanzo beans, a can of diced tomatoes, can of chicken broth and shredded chicken + this packet and it was done and perfect. Talk about easy. If you haven’t tried these you HAVE to buy them the next time your out shopping. I’ve purchased them at Super Target when I lived in Minnesota and currently find them at Sendiks, Whole Foods and Metro Market in the Milwaukee area. Also, while some of the taco ones say skillet sauce I also use these in a small crock pot. Add the Taco skillet sauce over the meat and cook for a few hours (not all day). I do this so when my kids are starved at 5:30 all I have to do is assemble the tacos. Without further ado here are their sauce and mix packets. It’s hard to pick a favorite food when you’re 40 weeks and 5 days pregnant but my normal evening snack these days is pretty consistently cereal. I’ve never been a big cereal eater for breakfast as I always seem to get hungry quicker than if I have something with more protein like my normal English Muffin with peanut butter, egg or oatmeal with nuts, soy milk and nut butter mixed in. That being said I absolutely LOVE having cereal as my bedtime snack. One, because I often want something cold (if not cereal then ice cream tends to be my pick) and two because I love the crunch. When it comes to picking out cereals there are four things that are important to me in evaluating the nutritional value. YES this cereal is above 30% calories from sugar (which on one hand I’m surprised by with its commercials and claims. On the other hand it does taste like the flakes are sweetened and it has fruit in it with natural sugar so with that in mind I’m not surprised). October means fall leaves, pumpkins, Halloween and candy. With candy and baby costumes on my mind I thought I’d feature chocolate foods that I love this month. As most of you know I have a huge sweet tooth and I like to indulge it. Allowing myself to indulge without over doing it is always a challenge. I love searching for new products that fulfill this craving with a healthy twist so my waistline doesn’t suffer. 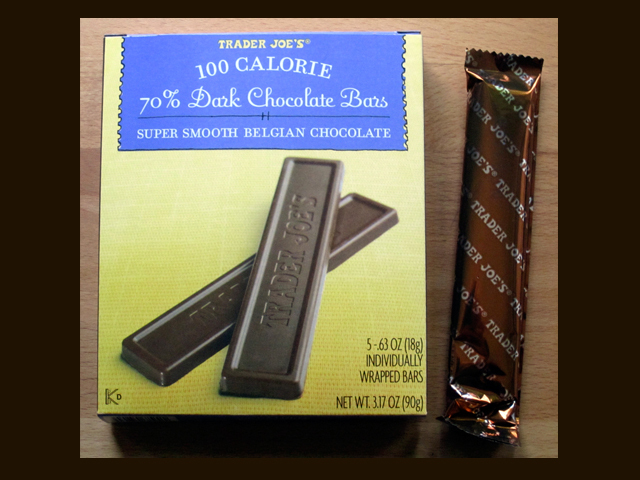 Here are two of the newest chocolate foods I love and satisfying my craving. Good quality dark chocolate so a small amount is satisfying (I warn you. Take a few and walk away!). I always feel myself wanting something more when I eat milk chocolate but a good dark chocolate is incomparable. Low in saturated fat and lactose and dairy free! Well life as a working mom has taken full affect and sadly the blog has gotten hit the hardest. I apologize to all my followers for the lack of posts lately but in all honesty my meals have been rather quickly put together and taking a picture of it has not been on my mind. The good news is I’ve adjusted back to working and have already found a few recipes I want to try and post about. Until then I’ve decided to post about a new topic and share a picture of the baby. With the ever evolving world of food science and product development I thought I’d try to share products that I find and love or ones I’ve used for years. For my first post on this subject I’m featuring a new found joy and an old classic favorite! Both are quick, easy and healthy snacks which makes them both a go to in our house. It’s healthy. The ingredients literally are “DRIED MANGOES.” That’s it and that’s all I need it to be! Why I really love this product. I think I’m eating dessert but I’m still getting some nutrition. It’s sweet and tastes like a treat at the end of a meal. I love bringing them to lunch! I can’t believe it’s already October. While the leaves have started to change the weather here in Minnesota has been unseasonably warm with expected highs in the upper 70’s/low 80’s all week. It was a perfect weekend for me from weather to Wisconsin sports (if you missed it the Badgers, Brewers and Packers all won) to a belly full of delicious, crunchy, sweet apples! It’s apple season and I am so happy about it. I’m not a person that eats apples year round but when it comes to the fall I eat enough to last me the rest of the year. Lately, I’ve been on a two a day average switching off between Honeycrisp and Haralson’s, both grown in Minnesota. If you couldn’t tell, apples are this month’s food of the month. Apples contain ~ 90 calories, a little over 3 grams of fiber and surprisingly they are ~85% water. They are very nutritious for us containing many nutrients including Vitamin A, Vitamin C, thiamine, riboflavin, calcium, phosphorus, potassium, pectins and fiber. A new variety available this year is called the SweeTango which was developed by the University of Minnesota. It is said to have the texture of a honeycrisp and the flavor of a Zestar. I can’t wait to try it or hear your reviews if you took a bite out of one already. If you want to eat more fruit or are craving something sweet and fresh grab an apple and start crunching away. I just returned from an eight day trip in the Pacific north west and Canada and while part of September is over it’s still not to late to enjoy this months food. Peppers! They come in many shapes, sizes, colors and spice levels. The Scoville Heat Scale is a great way to see what level of pepper is best for you. To start the celebration of the food of the month I made Un-Stuffed Peppers. You may be asking why I made the recipe “unstuffed.” It came down to the size of my peppers. I was planning to make stuffed peppers for dinner but all the peppers I wanted to stuff were too small to fit much filling so instead I mixed all the things you would put in a stuffed pepper together in a dish and baked it. 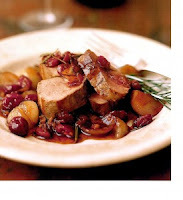 I am eating this dish as I type my blog post and OMG it’s AMAZING! Every year when I make stuffed peppers I just use up what I have in my fridge and that is what this recipe was but the flavors came together perfect. The pepper mix was perfect since my husband and I like a small kick in our dishes. This is a great dish that we will definitely have again! Grease a 9 x 11 pan and pile ingredients in. …just went and got seconds…time to go.The beauty of this dish is it’s flexibility. Don’t have one of the ingredients or want to add another vegetable, go for it. It took awhile to heat up this summer but now that it has it sure feels good. Most of the time by July the hot temps can be bothersome but after all the rainy days I’m enjoying my 80 and 90 degree days.This time of year I always crave cold things and berries are on the top of that list. July’s featured food is blueberries. If you’ve watched the news or read any magazine in the past 5-10 years then it will be no surprise to you that this small, vibrant, juicy fruit is a “super food.” They are low in calories, only 80 per cup, and rich in nutrients. In addition, these small blue berries are a great source of Vitamin C (1 serving has 14 mg–about 25% of our recommended intake for the day) and rich in antioxidants which protect our cells from damage. The good thing about this super fruit is that it is packed with flavor so it’s easy to indulge! As I’m writing this I’m enjoying fresh blueberries in my yogurt…Mmm. Besides eating them plain my other favorite ways to eat them are in smoothies, cereal or baked into oatmeal pancakes. Really you can add them to anything including salads or salad dressings. Another benefit of blueberries for me is the memories that they bring back. Growing up my friend Katie ( who I was inseparable from) and I used to go to my cabin for the 4th of July and we started a tradition of making an American flag cake. It’s a great dessert for the 4th because it is quick to make (doesn’t require baking) refreshing and contains fruit! Start with pound cake (growing up we used Sara Lee) cut thin and layered in the bottom of a 9 x 11 pan. Next layer on fat free cool whip and then top with strawberries and blueberries to look like a flag. There are many variations of these flags including layered puddings and other fruit cakes with the fruit and whipped cream toppings. If you don’t have something to serve for tomorrow whip this up this afternoon. You’ll be pleasantly surprised. Ours never looked this nice but here’s a great example of what it can look like. I know what you’re thinking it’s June 4th and I’m a little behind on my food of the month. I apologize for my neglect to the blog. I’ve been outside pulling out bushes, weeding my garden and our summer season of weddings and bachelorette parties officially began last night. So needless to say I’ve been very limited on finding free time to blog but I haven’t forgotten about this months food. After many dinners on the grill due to a broken oven I thought I would dedicate this month (…ahem…the best month of the year…) to turkey burgers. Turkey burgers are so easy to make and can be a healthier alternative to beef burgers. I’m not talking about buying turkey patties and throwing them on the grill. I’m talking about homemade turkey patties. Starting with ground turkey, adding in chopped veggies, cheese and spices, forming them into patties and then tossing them on the grill to cook. 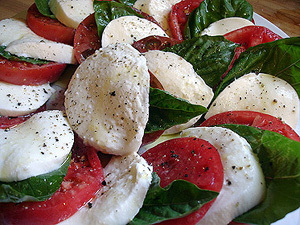 The combinations and varieties you can make are endless which makes them a fun food to cook throughout the summer months. The first thing to know is what to look for when you buy ground turkey since the varieties at the store aren’t all the same. Frozen ground turkey is usually dark meat and can actually contain skin in it. This type of turkey is just as high in fat as ground beef. I recommend not using this type of turkey. Regular ground turkey, which is labeled as 93% lean is usually part white and part dark meat and can still be fairly high in calories and fat although still less fat than ground beef. Ground turkey breast, is the lowest in fat. This can also be used in recipes but it dries out easily so you may need to add an egg to the burgers. I tend to buy the lean ground turkey for burgers since it doesn’t get as dry but find that the ground turkey breast works well in soups, stews and chili’s. This past week I decided to make crop share turkey burgers. I chopped up some of the ramps I had left, which by the way I’m obsessed with. If you are ever at a farmers market and see them BUY them. You can add them to almost anything for a garlic/onion flavor. I then added in my leftover chives, some spinach and crumbled feta cheese. We grilled them and topped them with a thin slice of Swiss cheese and served them on a whole wheat bun with a side of corn and asparagus. It was a delicious dinner. The burgers were very juicy and flavorful. Shape into 8 patties and grill or broil. Love is in the air. I can tell it’s February and Valentine’s Day is approaching from the plethora of magazine advertisements and TV commercials sharing the “perfect gift” to buy your loved ones. If you are like me then there is no need to step foot into a jewelry store when you can just buy chocolate. What better food to feature this month than the one and only chocolate! While I still wouldn’t consider chocolate a health food a small amount each day may be beneficial towards our health. Let me explain why. Cocoa beans contain flavanols which are a good antioxidants that can help reduce cell damage to the heart, lower blood pressure and help the lining of blood vessels. In addition, one study showed it lowered LDL cholesterol (a.k.a bad cholesterol) by 5 points. Not a significant decrease but a trend down from indulging in a chocolate craving is great to hear. 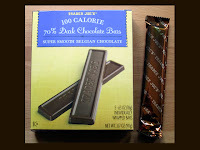 Flavanols are more abundant in dark chocolate bars ranging from 50-80% while milk chocolate bars only contains 15-25%. For the most benefits choose dark chocolate bars with 60% cocoa and limit yourself to one or 2 squares a day as it is high in calories. 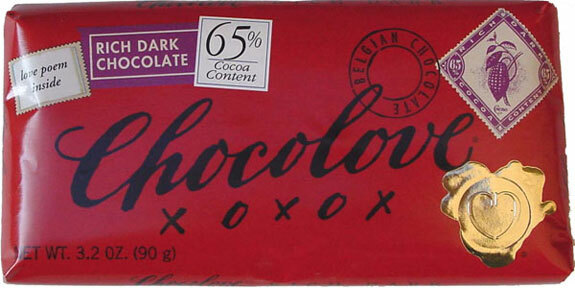 If you are new to trying dark chocolate start with a lower percent cocoa and work your way up. The higher the cocoa content the more bitter the bar will taste. I think most dark chocolate lovers would agree it’s an acquired taste but much more satisfying than milk chocolate. Multiple varieties of dark chocolate bars that range from 55-77% cocoa with ginger, peppermint, sea salt, almonds, cherries, chilies, raspberries or orange peels added for extra flavor. High percentage of cocoa and pre-portioned packages. 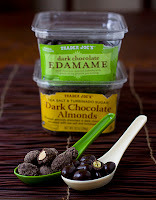 Great to keep around for chocolate cravings. I usually find them near the checkout. A great balance of protein, fiber and dark chocolate decadence. Feeling creative or want to design the perfect chocolate bar for you Valentine this month. Check out createmychocolate.com/ to design your own bar. You get to choose the type of chocolate, mix ins and name of your creation. It doesn’t get much better than that.